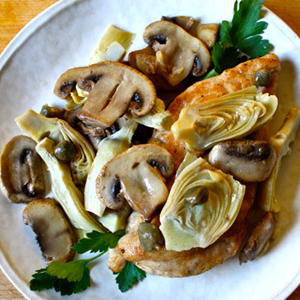 This flavorful chicken piccata recipe is topped with mushrooms, artichokes, and capers. It has 27 grams of protein per serving and only 240 calories. Place chicken in a resealable plastic bag. Add flour and seal. Shake to coat chicken. Add chicken, cook for 3 minutes on each side, or until browned. Add garlic; cook for 1 to 2 minutes or until tender. 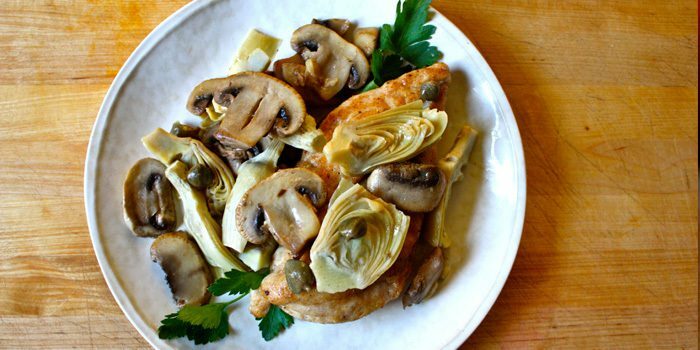 Add lemon juice, broth, capers, artichoke hearts, and mushrooms; cook, turning chicken halfway through, for 12 to 15 minutes, or until chicken is no longer pink in the middle.